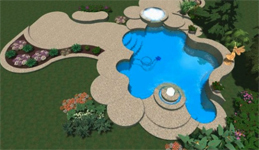 As one of Little Rock's most experienced swimming pool companies, we want to make sure you know exactly what you are wanting before your pools construction is underway. If you're looking for ideas for the backyard of your dreams, you've come to the right place. We've put together some resources that will help you as you start planning not only your custom swimming pool, but your complete backyard oasis. Visit our gallery to see what we've built in the past and get ideas for your future pool. 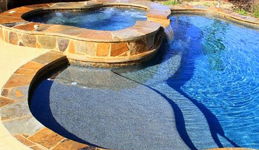 We've built a variety of swimming pools in Little Rock, North Little Rock, Hot Springs, Cabot, Maumelle, Conway, Bryant, Benton and many other areas. Each swimming pool we build is customized to fit not only your backyard, but your family's preferences. See some of the popular features you can add to your pool that will take it from ordinary to extraordinary. Features like, waterfalls and fountains, spas, tanning reefs and swim up bars can make your pool a true escape. 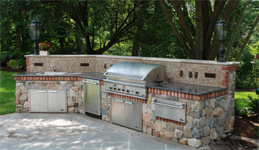 Adding an outdoor kitchen and dining area can allow you to spend more time near your pool and landscaping, patios and outdoor lighting can help complete your backyard design. See some of the backyard options that help bring everything together. Adding a swimming pool to your backyard is a big investment and a big decision. Read our advice on planning and building your pool. We want to help make the process as smooth as possible and don't want you to make an decisions you will regret down the road.